The Coalition’s message was clear. Organic standards should be molded to enhance the profitability of the large corporate farms that are quickly coming to dominate “certified organic”. Going far beyond defending hydroponics, the Coalition attacked the NOSB. They also dismissed the proposed rules eliminating CAFO (Contained Animal Feeding Operation) chicken operations as being a minor “outlier issue.” It seems that Roberts, the large CAFO operators, and the Coalition are birds of a feather. The Big Boys have had enough. We are witnessing an attempted hostile takeover of the National Organic Program. There has been talk of creating a new label within the USDA for “Certified Hydroponic Organic”. I would suggest a better label: “USDA Certified Fauxganic”. The new Fauxganic label could also include the CAFO dairies, the CAFO eggs, CAFO meat, and the magically transformed conventional grain that has flooded the organic market in recent years. At last, there will be a proper label to clarify so much of what is currently confusing and dismaying the eaters of America. Fauxganic producers can be recognized by their common belief that healthy soil is irrelevant. listen to Crisantes’ testimony at hearing of Senate Agriculture Committee. In his Senate testimony, Coalition for Sustainable Profits spokesperson Theo Crisantes didn’t speak much about hydroponics. Moreover what he said about hy-dro was misleading. But what he did speak more about was the need to reform the NOP so the NOSB has much less influence. He claimed there was too much public debate. Decisions need to be made behind closed doors by a few power brokers. It was perfect symbolism that his first Congressional testimony to a House subcommittee was also behind closed doors. Crisantes also called for change in the makeup of the NOSB so that it better represented the Trade. Right now the members of the NOSB are all selected by the Secretary of Agriculture, and those choices sometimes seem quite distant from the intentions of Senator Leahy and the organic supporters who championed the creation of the NOP. Clearly, some “farmer representatives” such as recent NOSB member Carmela Beck (a mid-level administrator from Driscoll’s) would not be called “farmers” by most reasonable people. Nonetheless, there are some wonderful people who care deeply about the organic movement currently serving on the NOSB. The de-bates and votes are public. All decisions are open to input from all who are interested. The Coalition’s comments are in keeping with the written testimony submitted to the NOSB from such corporate farms as Driscoll’s Berries (over 1000 acres of hydroponic “organic “ berries), Nature Sweet (over 1200 acres of conventional greenhouse tomatoes), Houweling Greenhouses (over 250 acres of conventional greenhouse tomatoes), Pura Natura (the umbrella organization for the Dutch greenhouse growers who export their EU conventional hydro produce to the US where it is welcomed as organic), and Scott’s Miracle Gro (what can I say? Welcome to Fauxganics). Perhaps all these corporations are members of the Coalition, but no one knows for sure, as the Coalition’s membership, like the way they grow their produce and the way they spend their money, is a secret. When I served on the USDA Hydroponic Task Force, we were unable to get a single hydroponic member of the task force to share exactly what they used to fertilize their crop. We were told it was a secret. These are efficiently run organizations that do what they do well, but they have no business selling their products as organic unless they are willing to pro-foundly change how they farm. And so far they are not willing to do that. They are only interested in using the USDA label for the price premium. Nate Lewis is one of the chief lobbyists for the OTA, which has worked aggressively to approve hydroponic certification for their clients Driscoll’s Berries and Wholesum Harvest. They also worked closely with Senators Roberts and Stabenow on the Congressional action that destroyed States’ right to label GMOs. So why would the Coalition publicly call for war on the NOSB? Because they fear losing in the NOSB. They have the lobbying power to get things done their way in Congress. In the spirit of Trump, they are ready to “Just Take It” because they can. The (relatively weak) animal welfare reforms that were worked on for so many years before passage by the USDA were exiled to the oblivion of “further study” by the Trump administration, with the active support of Roberts and Stabenow. So too, the dark forces are not likely to allow us children to deny them their hydroponic profits. The very fact that Congress was listening to a fringe group like the Coalition for guidance on organics is a clear sign that the organic community is in deep trouble. 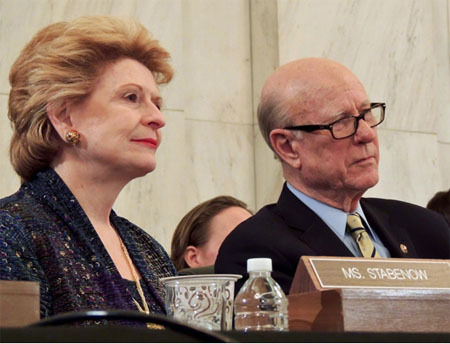 Senators Pat Roberts and Debbie Stabenow have led the recent Congressional attack on the NOP’s proposed animal welfare standards. Roberts, infamous for his disdain of organic, has become a strong champion for the Fauxganic egg producers in his home state of Kansas. Roberts called the reform standards (which took years to gain passage in the NOP) “absolutely ridiculous.” He is on record saying, “What is chicken enrichment anyway? It could be yoga, that might be difficult. Video games? They do that for various animals. Sports? A gourmet meal? I think probably music is the best thing we can do to entice the chickens to come out and be happier, you know free range, roaming around. I think probably Ray Price would be the best person. Certainly not Prince. At any rate, something soothing.” Roberts’ contempt for the very concept of animal welfare is profoundly disturbing, as he is the powerful Chair of the Senate Ag Committee. Roberts seems to be the new best friend of the Coalition, supporting their inclusion in the organic program that he despises. The Coalition testimony included references to the debate on CAFO (feedlot) “organic” chickens as being “a distraction” from important issues. At last Roberts has found a champion in the “or-ganic community” for his appalling vision of irresponsible agriculture. It appears that Roberts and Stabenow have a plan for a new kind of National Organic Program in the upcoming Farm Bill. Wonderful words. For all their calls for transparency, OTA works very hard to keep the issue of hydroponic production as confusing as possible for the NOSB and the consumers. They continually insist that their clients Driscoll’s and Wholesum Harvest are not hydroponic. They claim they are “container growers”. OTA knows perfectly well that ALL of the conventional hydroponic tomato, pepper, cucumber and most of the berry growers are “container growers” as well. While it is possible to grow without hydroponics in a container, Driscoll’s and Wholesum cannot make such a claim. They are hydroponic by any sane defini-tion. So if you aren’t upset, you aren’t paying attention. The Senate testimony was an amazing coming out for the hydroponic lobby. Why would they attack the NOSB before a crucial vote, even if they believed what they said? Because they are afraid they are going to lose. Again. And they will lose if we keep speaking out. There are protest rallies coming soon. Contact me (www.longwindfarm.com) if you are interested in organizing a local rally in your area this Fall. People are waking up and coming together. The Fauxganic Takeover is out in the open now. It is the same dreary land grab that has happened over and over. If we believe in real organic, our work is far from finished. Real organic is more important than ever. One thing is for sure. Even if the Fauxganic forces triumph in the regulatory world, they can never win in the end, because Fauxganic is not Organic. It is not what people are looking for, although it might take people a while to figure that out. It will never be organic, no matter what it is called. And there are way too many of us for it to go unnoticed. People are seeking real food. We are seeking an agriculture that will support the planet and nourish us. As we learn about the Fauxganic Takeover, we must not be silent.